Whether you’re the patient, the dental hygienist or the dentist, Oraqix gives you something to smile about. 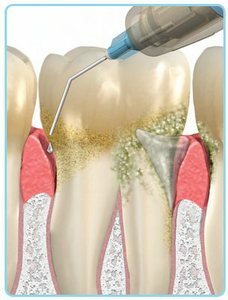 Since 2004, Oraqix has changed the way pain relief is administered to patients undergoing periodontal debridement—a tedious, time-consuming and oftentimes uncomfortable procedure. In as little as 30 seconds, Oraqix puts patients at ease—eliminating the needle and the potential for pain. With patients more comfortable, dental hygienists can perform the procedure better and faster. And dentists and dental hygienists alike, are confident in choosing Oraqix because it is FDA-approved with a well-established safety profile. There is some evidence that full mouth scaling and root planing may improve therapeutic results in patients.3 The reason for this, in simple terms, is that treating and removing bacteria at one time, in the entire mouth, may prevent bacteria from translocating to treated areas from untreated areas in between visits.